One of the safest asset classes in the world no longer guarantees investors anything. During periods of economic-growth scares and market volatility, government bonds are a top safe haven choice for investors. But they’re not that useful as hedges anymore. In a note Tuesday, Goldman strategist Christian Mueller-Glissmann laid out strategies for managing risk during periods of equity-market downturns. But “the current low levels of bond yields might constrain their ability to hedge ‘growth’ shocks,” he wrote. That’s because yields are historically quite low, and they have been driven down by the strong safe-haven buying that Mueller-Glissmann is critically discussing. He noted that the level of bond yields at the beginning of S&P 500 corrections — of 10% or more — since the 1990s have been comparatively much higher. Just on Tuesday, the yield on the 10-year German Bund, considered the benchmark for eurozone borrowing costs, fell to a record low of 0.045% as investors, once again, bought the note for safety. 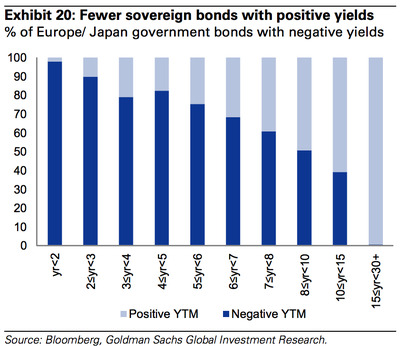 And the use of negative interest rates in the region and in Japan is not helping, either. 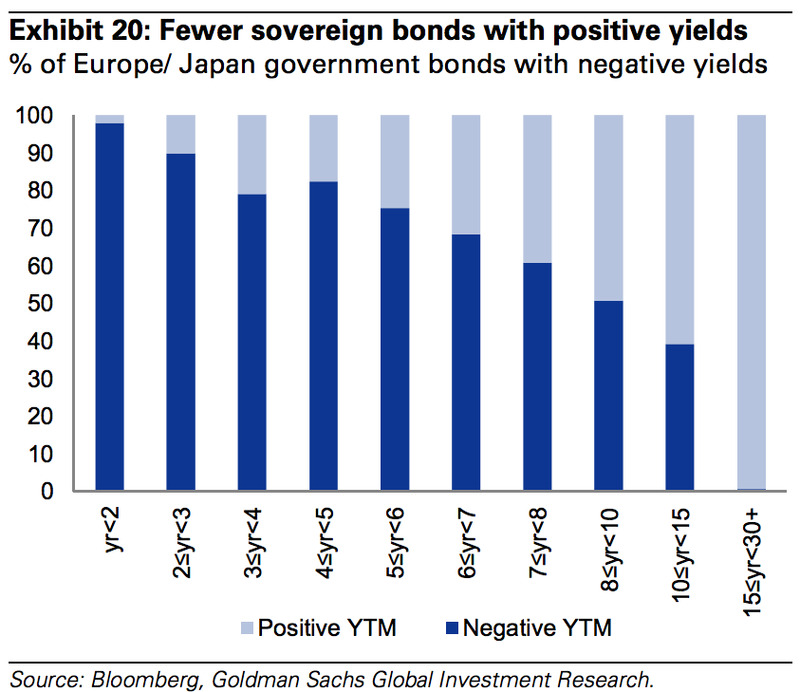 “Besides providing limiting buffer for ‘growth shocks’ the current low level of bond yields offers very little positive carry as negative yields are becoming more widespread in Europe and Japan,” Mueller-Glissmann wrote. Besides the potential for low returns, bonds could become risky themselves. Muller-Glissmann wrote that they could become volatile if there’s any inflationary event or monetary-policy move that catches the short-end of the curve by surprise.